In 1934, Mr. Davis joined Ken-Rad Tube and Lamp Corporation, Owensboro, Kentucky, as an engineer. When the company was acquired by General Electric Company in 1945, he was appointed manager of Owensboro operations. With the competitiveness learned from Coach Rupp, Mr. Davis continued to distinguish himself at General Electric and in 1960 was elected a vice president. 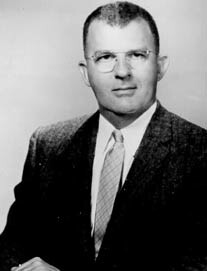 Moving his family to Washington, D.C. in 1966, he became head of GE’s defense programs division until retirement in 1976. Active in various professional organizations, he is past president of the Electronic Industries Association. He received their Medal of Honor in recognition of his outstanding contributions to the advancement of the electronic industries. His community service and state activities encompassed many years. Over the years, Mr. Davis has shown his support for his university by serving as president of the University of Kentucky Alumni Association. He was one of the first members of the central committee of the Century Club (one of the first gift clubs at UK), was a founding member of the UK Development Council and the Fellows Program. Mr. Davis was inducted into the College of Engineering Hall of Distinction in 1996. He now resides in Fairfield, Iowa. He and his late wife, the former Elizabeth Miller were the parents of two children, Cynthia Lindell and Dr. L. Berkley Davis, Jr.